Are your emails easy to read and absorb? They’re an essential part of business communications, and not always just about the content. How is your email structured, visually? Are things sloppy and cryptic, or organized and clear? People are busy, and constantly trying to keep up with their exploding inbox. If you are careless with your messages, you could be annoying your reader, and shedding an unprofessional light. Whether you’re emailing a customer, prospect, supplier, or colleague, using the following email writing tips will make your communications more clear and effective. Your audience will appreciate your professional approach to communicating with them. Don’t lose business because of sloppy habits. Put effort into the subject line. It’s what will get your email opened, and will make it easy for your reader to prioritize what they read first, and to find your message in their inbox if they need to reference it later. One topic, whenever possible – The subject line should be something that pertains to the main topic of the message. Be detailed whenever possible. That email subject line tells me that something is wrong with my order. I better pay attention, and open it. No text-like messages – Don’t start your message in the subject line. Often people will ask a question in the subject line, which requires an answer. That can lead to confusion when there are multiple emails back and forth, because the conversation evolves. e.g., Are we on for 10? 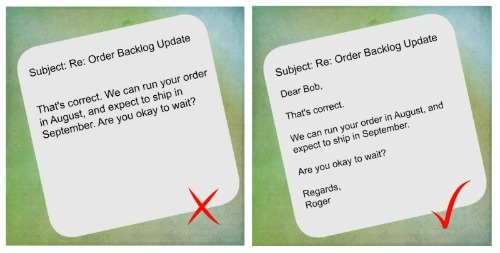 What if the implied appointment needs to be cancelled, and in the reply message there is reference to a task, or job that needs to be done, a customer that needs to contacted? If your reader wants to reference that customer-related conversation in the future, the subject line won’t be obvious, and will make it more difficult for them to find. Don’t forget the subject line – If you leave it out, when your email shows up in your target’s inbox, they are less likely to open it, because they won’t know what it’s about. 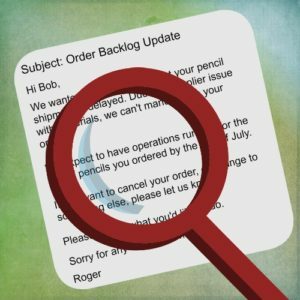 Think of every email that you send to a customer, supplier, or other business colleague, as a printed letter. Remember those? Write in proper sentences, and be sure to have a beginning, middle, and an end, to your communication. Salutation – How you start your message will depend on the relationship you have with your reader. Message Body – Try to write in proper sentences and paragraphs, and be concise. Nobody has time to read lengthy emails. Get to the point. Try not to have just a big blob of text, either, as it will be difficult to read. It’s overwhelming to look at. You can be a little less formal than a business letter, in that you can break up your sentences with extra lines between them. That makes your message easier to scan. Close – Two parts here. First, you can put a courteous sentence or phrase to indicate the message is over. Second, comes your signature. If it is formal, put your full name, title, company, and contact information. If it is informal, when the person knows you, you can just put your first name. …all depending on the relationship with your reader. Even if you are on your fourth email response, start your email with ‘Hi Bob’, and sign off with ‘Regards, your name’, or even just your name, without ‘regards’. If you don’t sign off each time, it can sound like you’re rushed, and not paying particular attention to the person you are emailing, or the message itself. 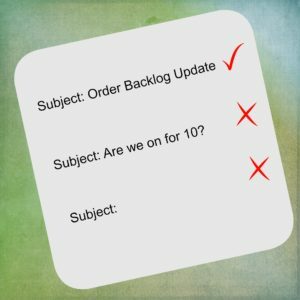 Multiple Sub Topics – If you have to put several sub topics in an email, break them up by putting a sub-heading before each topic. Use capital letters to help identify the topic switch, and make your message easier to scan, and information easier to find. 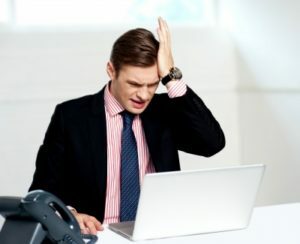 Only One Conversation – When communicating back and forth, based on your initial email, remember to stick to the topic at hand. If there are several emails back and forth, then that conversation is all together in one email thread. If for some reason you have other subjects that need addressing with the reader, put them in a new email. You will be starting a new conversations and keeping all the topics together. It’s so much more efficient for both you and the reader, if you have to reference the information in the future. 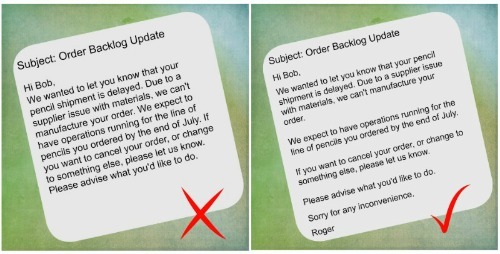 The examples of the email thread between Bob and Roger have been talking about Bob’s back order. All subsequent conversations would be about shipping, timing, and any other pertinent information related to that specific transaction. 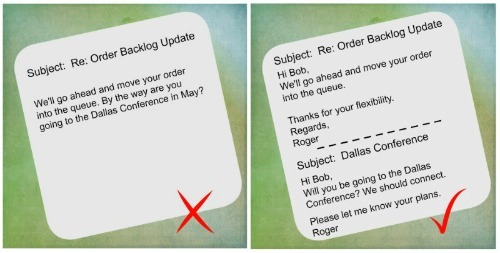 Take the Dallas conference conversation into a new email, because it has nothing to do with the back order messages, and will likely entail a whole new set of message that you want to keep together. Before you hit the send button, proofread and check everything. Read everything out loud. It’s easier to find your errors, and you can hear what your content sounds like. Does your tone sound pleasing, or condescending? Are you getting across what you want to say in clear language? Do you have a Subject Line? Did you say that you are including an attachment? Be sure you have attached that document. Test any links that you are sharing. Review all signature elements – i.e. contact information, social sites, etc. This is especially true if you have set up an automatic signature. Things changes, technology plays tricks. Make sure your information is accurate. You know yourself how busy your inbox can be. If you deem your message important to read, then you have to make it easy for your audience to read. Consider the email writing tips in this post. The next email you send, think about more than just the content. Consider the visual effectiveness of your message, and use these tips to make a stronger impact. Remember, your reader is busy. Make it easy for them. Your professional approach to presenting your email message will be appreciated, create more effective conversations, and build a stronger relationship with your audience. If you’d like an evaluation of your email effectiveness, contact us for a free consultation.